Bottom Line: Wonderful greenspace in Georgetown with really fun fountains for the kids and opportunity to ride bikes or scooters. Metered street parking (or parking garages), no bathrooms, full sun. 4/5 stars. 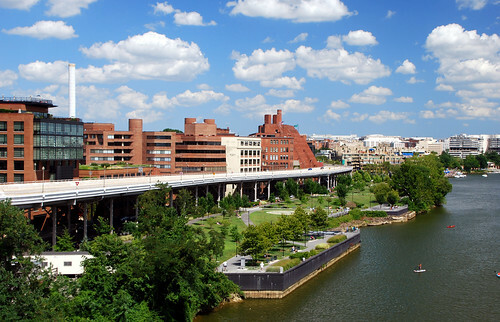 The Georgetown waterfront was redeveloped in 2011 into a lovely, ten acre urban park that runs along the Potomac River from the Washington Harbor to the Key Bridge. Visitors of all ages will enjoy this beautiful green space. It features wonderful views of the Potomac River and ample paths for walkers, cyclists and skaters. The highlight for kids will probably be the spray fountains. The park has been open for a few years. but I finally took my crew to check it out on a delightfully warm but not-too-hot August day. The spray fountains, located along the river where Wisconsin meets K St (under the Whitehurst Freeway), are visually attractive and a lot of fun to play in. My kids found the surface uncomfortable for bare feet, so they wore their flip flops when in the spray. In addition to the fountains, my kids loved the oversized steps that led down to the Potomac River. Those with young children might find this easy access to the river unnerving. There are spectacular views along the river from the Kennedy Center to the south to the Key Bridge to the north. But for my kids, the real draw was the ducks. My kids really wanted to feed the birds, as others were doing, but we didn’t because it’s not a good idea to feed the ducks. The river views are wonderful and we enjoyed observing the many different types of transportation. We saw kayakers, canoers, paddleboarders, tour boats, and power boats. The park is also along the flight path for National airport, so we saw airplanes and the occasional helicopter. The park itself has broad paths and open space that made it a great place to ride scooters or go on a bike ride. Along the river path, we found granite slabs etched with historical scenes and information about the park. These are great for educating yourself about the history of the park, or an impromptu slide. The Labyrinth is another fun feature. For some, it is a place of quiet meditation and contemplation. For others (ahem), it’s a place to run and scooter like crazy through the “maze”. We found ample parking underneath the Whitehurst Freeway (weekends might be more challenging). It is metered parking, good for up to 4 hours, priced at $2/hr. There are also more expensive parking garages nearby. I used the Park Mobile app on my phone to pay for parking (it gives you the option to extend time, if needed). There are no public bathrooms anywhere near by, so “go before you go”. There are restaurants within a short walk — to the east in the Washington Harbor complex, or up Wisconsin (a hill). All in all we found the Georgetown Waterfront Park a delightful place to visit and play. "Georgetown Waterfront Park (DC)", 5 out of 5 based on 1 ratings.